Amazon has got this set of 48 disposable 5 oz. wine glasses for $16.99 with free Prime shipping (31 cents per wine glass). 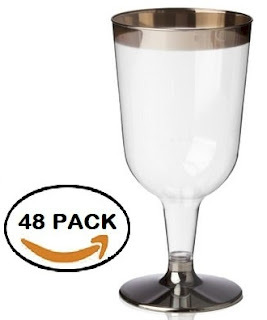 These disposable wine glasses got 4.4 out of 5 stars over 16 customer reviews. I love the silver band across the top. Set of 48 durable and sturdy silver rimmed wine cups. 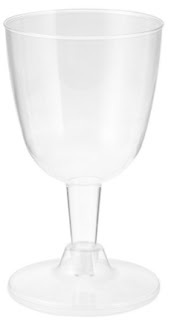 These disposable wine glasses have a 5 oz capacity, 5 inch height, and a 2.5 inch diameter. Silver rimmed wine cups are perfect for parties, weddings, holidays, anniversaries, caterings, food service, dinners, gatherings, bridal showers, cocktail parties and much more. If you're interested in a more budget-friendly disposable wine glasses, check out this 40-count set of 5 oz. wine glasses for $6.28 (16 cents per wine glass). No silver band, but about half the price of the first deal (per glass).